The clichés swirled around in my head as I dusted off the 20-year-old project again in February. Maybe this would finally be the moment when “ISLAND OF LIGHTS” would finally be green-lighted. A beacon of lights would finally illuminate the gateway to University Park. And why not? The concept of a public art installation, designed by a famed artist utilizing historic street lights as a centerpiece to the revival of a small pocket park called the Hoover-Union Triangle, is just as valid today as it was in 1993, when the project was first proposed, and again in 2000, when the project was revived –– the first time. It is with extreme sadness and a profound sense of loss that I share with you news of the sudden and unexpected passing of our close friend and neighbor Corinne Pleger over Thanksgiving weekend. Corinne was a past president of WAHA and directed our annual Living History Tour for ten years. She was also a vital and integral participant in many other organizations. Her presence and friendship will be sorely missed. A Memorial Service for Corinne has been scheduled for this coming Saturday, December 10th at 1:00 p.m. It will take place at the Egyptian Theatre followed by a reception at the family's home in West Adams. 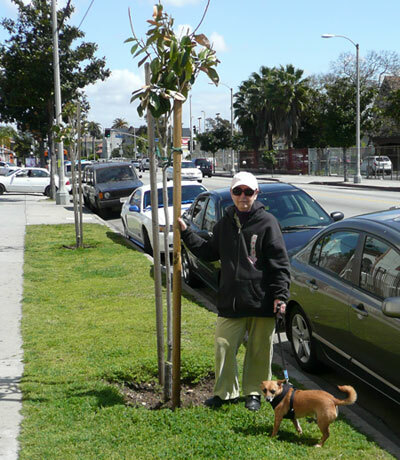 Jennifer Charnofsky with one of the trees WAHA helped plant on Adams Blvd. West Adams is home to six of the city's twenty-seven Historic Preservation Overlay Zones, a unique treasure of early twentieth century houses. Detracting from the beauty of these lovely old homes, however, are some of the neglected commercial corridors, most notably along Adams Blvd. in the Adams-Normandie HPOZ. In 2009 several WAHA members in local block clubs enlisted Mayor Villaraigosa's Million Tree project to plant 26 trees on Adams Blvd. between Vermont and Normandie Avenues. When fully grown years from now they will provide a leafy canopy that will transform the look of this tired thoroughfare -- and hopefully encourage some historically sensitive development as well. The trees were free, but local groups had to agree to pay for regular watering and maintenance for the first three years. The trees went into the ground in April 2009. The planting and care is done by the Koreatown Youth and Community Center, a nonprofit that has planted more than 4,000 trees for the city. Block clubs and the local neighborhood council paid for the first year of care. WAHA contributed $400 directly to the second year. On Saturday, August 14, more than a hundred members and friends of WAHA came together to bring back the Ice Cream Social. It was such a success, that I thought we should share the event with all of you. You may not even realize that WAHA has it's own facebook page, which provides all of us another way to share and stay in contact. If you are on facebook, be sure to add West Adams Heritage to your favorites list. Just click on the link below to view the fun on facebook!!! 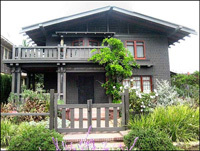 WAHA is looking for the best exterior paint finishes and gardens in West Adams, to be voted upon at the 4th of July event. Any house painted between June 1, 2009 to May 31, 2010 is eligible. Any garden in West Adams is eligible (newly planted or not). In both cases, the property must be within the Historic West Adams District. WAHA General Membership Meeting: Sunday, May 23, 11 a.m to 1 p.m.
We celebrate another National Preservation month this May with a general membership meeting traditionally and annually hosted by the Historic Preservation Committee. How appropriate that this year we will be in the former Stan’s Kite, an endangered Googie style coffee shop, whose demolition is part of the development proposals for the Washington Square Shopping Center mixed use project. Stan’s Kite, now Vintage Hollywood, is a very special venue. Located in the Washington Square Shopping Center at Washington Boulevard and 10th Avenue, the former Googie Style Stan’s Kite restaurant now houses Leroy Richardson III’s remarkable memorabilia collection of Afro-American celebrity entertainers. This Old House magazine has just made it official: West Adams is the best neighborhood in California for old house lovers. In its third annual, state-by-state survey, the popular monthly chose West Adams as the state's top neighborhood "where the historic homes (and life-affirming DIY challenges they bring) are rivaled only by the community spirit that surrounds them." 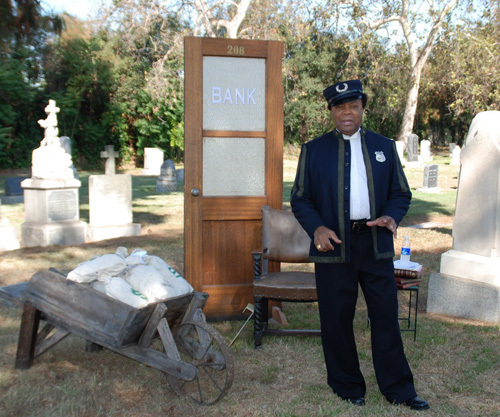 Our annual Living History Tour at the historic Angelus Rosedale Cemetery took place this year on September 26. Every year, WAHA selects different individuals buried at the cemetery to portray. Many West Adams preservationists celebrate their home's centennial with a party. But for Ed Trosper and David Raposa, their home's 100th anniversary year was ushered in with another milestone event. In late March, CBS filmed the 100th episode of the TV series Numb3rs at the Trosper/Raposa home, known officially in preservation circles as the Gray Residence, Los Angeles Historic-Cultural Monument No. 600. >This historic house appears weekly on TV in Numb3rs as the reel-life "Eppes family residence." In the show, one brother, Don Eppes (Rob Morrow) is an FBI agent helped in his crime-solving by his math genius brother, Charlie (David Krumholtz). Charlie lives in his family's "Pasadena" Craftsman home with his father, Alan (Judd Hirsch), a retired city planner. The series first aired in January, 2005, and the 100th episode is slated to air on May 1, during May Sweeps.